Designed for educators, this interactive webinar will show teachers how to use Open Educational Resources as effective components of their K-12 curriculum. Open Education Resources (OER) are free resources such as documents and media that are easy for teachers to share, use and reuse. Attendees will understand the value and availability of Open Education Resources and gain familiarity with Curriki as a source of OER, collaboration and resource organization. 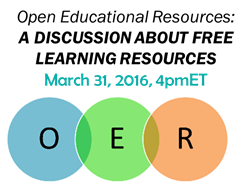 Designed for teachers and other educators, this interactive webinar will show you how to use Open Educational Resources as effective components of your curricula. Open Education Resources (OER) are free resources such as documents and media that are easy for teachers to share, use and reuse. This webinar is appropriate for K-12 teachers, librarians, department supervisors and school administrators. Curriki, the leading K-12 global community for creating, sharing, and finding Open Educational Resources (OER), has been a leader in Open Educational Resources for K-12 since 2007. As a non-profit, Curriki’s driving mission is to make education more equitable through the free and open distribution of OERs to the global education community. A non-profit organization, Curriki is the leading K-12 global community for teachers, students and parents to create, share, and find open learning resources that help teachers inspire learning in their students and inspire students to learn more every day. A Computerworld Honors Laureate for 2012, Curriki was selected as the 21st Century Achievement Award winner for Digital Access. With more than 464,000 members and 82,000+ learning assets, Curriki reaches more than 11 million users worldwide. Join today http://www.curriki.org.